Discover the eternal city with the most in-the-know and entertaining guidebook on the market. Whether you plan to brave the crowds visiting the Sistine Chapel, pick up picnic supplies at a mouthwatering market or shop till you drop on Via dei Condotti, The Rough Guide to Rome will show you the ideal places to sleep, eat, drink and relax along the way.Inside The Rough Guide to Rome- Independent, trusted reviews written with Rough Guides' trademark blend of humour, honesty and insight, to help you get the most out of your visit, with options to suit every budget.- Full-colour maps throughout - navigate the backstreets of Trastevere or the ruins of the Palatine Hill without needing to get online.- Itineraries - carefully planned routes, both by day and by theme, to help you organize your trip.- Detailed coverage - whether in the city centre or away from the hordes in the more residential neighbourhoods, this travel guide has in-depth practical advice for every step of the way. 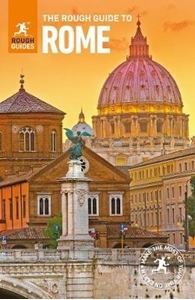 Areas covered include: the Centro Storico; the Vatican; Campo de'Fiori and the Ghetto; Piazza Venezia and the Capitoline Hill; the Tridenti and Trevi; the Quirinale and Via Veneto; Monti, Termini and the Esquiline Hill; Trastevere and the Janiculum Hill; Villa Borghese; the Aventine Hill, Testaccio and Ostiense; plus day-trips to Ostia Antica, Tivoli, Viterbo and more. Attractions include: the Colosseum; the Forum; Circus Maximus; the Pantheon; St Peter's; Galleria Borghese; Capitoline Museums; Vatican Museums; Trevi Fountain; Domus Aurea; Piazza Navona; Camp de'Fiori; and Ara Pacis.- Listings chapters - from accommodation to eating and drinking, clubs and live music, culture and entertainment, plus festivals, shops and markets, LGBT Rome, sports and Kids' Rome.- Basics - essential pre-departure practical information including getting there, local transport including a rundown of useful bus and tram routes, city tours, the media, public holidays, tourist passes and more.- Background information - a Contexts chapter devoted to history, architecture, books and films, plus a handy language section and glossary.